It is rare for me to visit a homeowner with a similar gardening style as mine because most folks are seeking traditional gardens or updates to typical foundation plants, but during a client visit in 2012, I met a homeowner who was experimenting with tropical plants and taking risks with some unusual specimens in her landscape. Because of my love of tropical plants and container gardening, the feeling was an immediate admiration for the touches she had incorporated into her gardening spaces. After quick introductions, she walked me around her property, and this is when I noticed plants which some gardeners may consider a nuisance because they are known to easily take over a garden area or possess aggressive habits. For example, she had an Aralia elata shrub planted in a small area near her front porch entrance. This plant is not difficult to grow, but is tough to move once established. It also has sharp prickles on the stems, and its roots will eventually sprout suckers. However, the variegated leaves and panicle style flowers growing at the top of the plant are rather curious as well as pretty. Observed up close, you will most likely admire this plant’s features. Where it was planted on her property was a little tight. Aralia elata can reach 10-15 feet tall and spread to 8 feet wide. It looks like a small ornamental tree at maturity with an unusual form. And it drops its leaves quickly after flowering and fruiting, so it can leave plant remnants later in the season. However, despite these things, she put it there to enjoy its features up close. I appreciated why she wanted it by the entrance to her front porch. It is a rare plant. Because it is not commonly seen, that in of itself, makes it intriguing. Uncommon plants add excitement and wonder to a garden space. Some plants with defense mechanisms make them more prolific in the garden, but this can also embody them with mysterious traits which make them stand out visually. And if you are well aware of their growing habits, you may be willing to accept them or work to manage their undesirables over time. This homeowner seemed to be aware of the nuisances of her specimens, but she didn’t seem to care. Meaning, she enjoyed the plant’s unusual forms and was willing to use them despite the consequences or potential risks, such as the plant’s ability to spread or leave litter on the lawn. She also has the benefit of employing a full time garden-maintenance person. Thus, perhaps, she did not feel the anguish of planting something that would require a higher vigilance in the long run. Or it could be that she just could not resist the temptations of a beautiful plant even if it has some beastly sides. Because of her unrestrained style combined with the willingness to listen and understand the caveats of a particular plant as I cautioned its use, I was free to include the unexpected and maybe not so well-tamed specimen plants in her garden design for a perennial bed she was anxious to install. And bear’s breeches (Acanthus spinosus), also called spiny bear’s breeches, was just one of those plant candidates. Bear’s breeches has rather interesting looking and showy flowers atop very tall flower stalks. 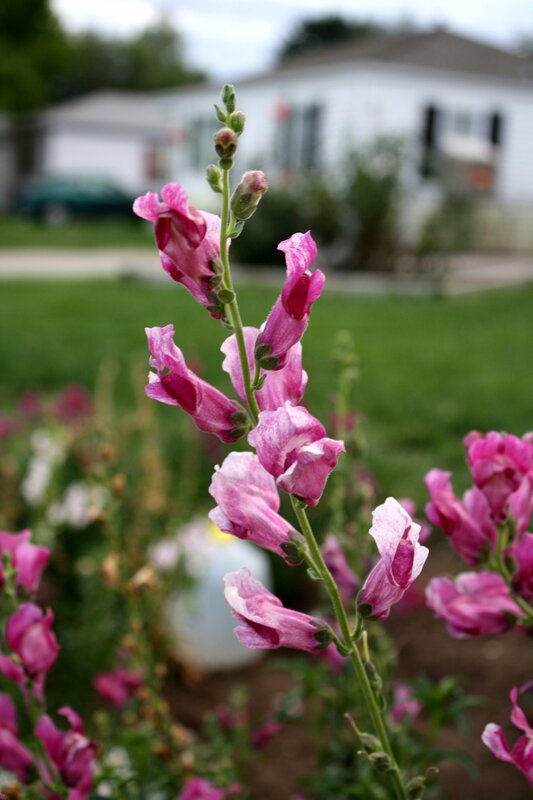 Each flower spike bears snapdragon like flowers which are vertically positioned. The flowers are composed of bracts (modified leaves), lobes, and tubes – to put it simply, and their composition makes them almost-alien looking while still remaining beautiful in form. The top hooded portion of the flower is mauve to purple, and the bottom is white. Because the plant can reach 3’ to 4’ tall, with a mounded foliage shape on the bottom, it can be rather significant in the garden. It is extremely visible due to the tall flowers rising above it on strong stalks which do not require staking. The flowers on this plant are a true beauty, but it is also a bit untypical looking. In my eyes, the individual flowers seem similar to a fantasized hooded-like orchid with the stature of a foxglove or Baptisia australis (blue false indigo). The plant provides architecture, texture, and interest and it is a long-performer in the garden even after its flowers pass. Although the leaves resemble thistle, which is considered a common roadside weed in Connecticut, the leaves are deeply cut, glossy green and leathery – adding nice texture especially when combined with plants of opposing texture. If you haven’t seen bear’s breeches before, the combination of the tall showy blooms with prominent foliage will make you pause to take a glance. Another bonus is the purple coloring on the top portion of the flower’s structure. This is a desirable color by many plant lovers, and it was a specific request by my client, along with the desire to have silver-colored foliage. Unfortunately, many silver foliaged plant candidates require full sun! Thus – these are the challenges of a garden designer. Similar to Aralia elata, bear’s breeches (also called spiny bear’s breeches) has prickles and thorns located on the foliage and in the flowers. Your fingertips or hands may get pricked if you are not careful – and your vehicle could receive damage should you locate bear’s breeches by a driveway’s edge. Accidentally brush up against it, and it will leave its mark. It is not just the prickly nature of the plant which can be off-putting, but it also has the tendency to spread by roots which will pop up new plants in other parts of the garden – once the plant is established. If you desire this look, where the plant repeats itself here and there, and you don’t mind it moving on its own, great. It can add a naturalistic effect in the garden while providing architecture due to the plant’s form and texture. But there’s another catch, spiny bear’s breeches are also slow to establish. You must be patient if you desire this spreading habit in your garden, which some folks do, and you also need to pay attention to the preferred cultural conditions because it tends to be flexible and picky at the same time. Bear’s breeches grows best in full sun to part shade, and some references indicate it is best grown in partial shade. The top blooming portion of the plant prefers more sun, but it performs better with some afternoon shade, especially if your climate is hot in the summer. Fortunately for me, my client’s garden bed area had both sun and shade at different parts of the day. As noted above, bear’s breeches’ aggressive side of spreading by its creeping rootstock easily occurs in loose soils which it prefers (well-drained soils), but it may stay put if you try to plant it in clay soils. However, if planted in heavy clay soils, this plant may get root rot because clay soils tend to remain wet. And slugs and snails will dine on the plant, especially in wet areas. Although this plant is often recommended for the back of a garden border because it grows large and tall, it also can be placed at an edge for up-close enjoyment. My client loved the look of this plant candidate as much as I did, and wanted to have it included despite its potential maintenance challenges of spreading, spines, prickles, size, repeating, and establishment. She understood the growth habits without hesitation and was very happy to be introduced to bear’s breeches as part of my design recommendations for a new perennial bed she was planning to install. As for myself, as a designer, I loved the freedom to use plants which have bold traits and long-lasting attributes despite their need for on-going maintenance and care. Plant care is often regarded as an undesired chore for many clients demanding low-maintenance plants. They just don’t want the problems, or they don’t have a full-time gardener to take care of their landscape! But if you find you are like this homeowner, or desire uniqueness in your outdoor surroundings, despite the potential regret or work later, then you too will find spiny bear’s breeches is a true beauty while accepting it is a beast. Or you can minimize the risk and use this plant as a “Troublemaker turned Star” in a container garden. This perennial is worth taking notice either way. Interesting read for sure! I learn something new every day ! Love this look back at greenery and blooming flowers! How I miss them!